Editor’s note: This story was originally published April 11, 2017, for the UC Davis News and Information in honor of Mathematics and Statistics Awareness Month. Math and statistics play a vital role in helping us understand the natural world and in technological innovation. 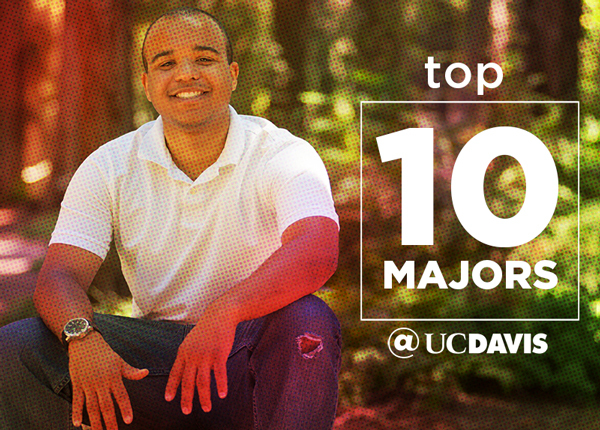 Check out these numbers and stories about mathematics and statistics at UC Davis. In 1933, Edward Roessler arrived at UC Davis to start a division of mathematics and physics, as well as a statistical service for researchers. The Department of Mathematics split from Physics in 1951. Statistics was established as a separate unit in 1979. In the 2015-16 academic year, the Department of Mathematics had 559 undergraduate students and 118 graduate students with 46.5 full-time equivalent faculty positions. It graduated 119 math majors and 30 students with a minor in math; eight master’s (one in math, seven in applied math); and 19 Ph.Ds (11 in math, eight in applied math). The UC Davis Department of Statistics is known for its strength in mathematical, theoretical, applied and computational statistics. Recent faculty hires have brought increased expertise in machine learning, big data analytics and data science. Many faculty are involved in research with professors in other fields such as atmospheric science, astrophysics, medicine and neuroscience. The number of students choosing statistics as a major or minor doubled between 2010-11 and 2015-16. In 2010-11, UC Davis graduated 36 students with a statistic major and 34 with a minor; by 2015-16, the numbers were 114 and 78. That might be because students understand this number: According to the U.S. Bureau of Labor Statistics, demand for statistics jobs will rise by 34 percent from 2014 to 2024, putting “statistician” among the fastest-growing occupations in the U.S. The growth is fueled by employers across all sectors, from the internet to agriculture, looking for ways to harness “big data” for their businesses. In 2015-16, Statistics had 354 undergraduates and 136 graduate students with 20 faculty. That year, the department graduated 114 students with a major in statistics and 78 with a minor in the subject — twice the number of graduates as in 2010-11. Also in 2015-16, UC Davis awarded two Ph.D.s and 55 master’s degrees in statistics, and three Ph.D.s and four master’s in biostatistics. The statistics department is also home to the Statistical Laboratory. The "Stat Lab" provides consultancy, collaboration, custom design and training in statistics for campus researchers. The nucleus of a cell in your body is less than 10 micrometers across, yet it contains two meters (about 6 feet) of packaged DNA. Professors Mariel Vazquez and Javier Arsuaga, who each has a joint appointment in the UC Davis Department of Mathematics and in the College of Biological Sciences, use mathematics to study just how DNA achieves this, and how this packing affects DNA function. Vazquez says: The DNA molecule is a right-handed helix, which in turn is coiled around proteins called histones to make “beads on a string,” which in turn is coiled around itself, and so on. The Arsuaga-Vazquez lab builds mathematical and computer models of DNA by considering the molecule as a curve. Understanding DNA through math can help biologists understand how DNA works and how perturbations in its structure are related to diseases such as cancer. For example, there is a family of enzymes called topoisomerases whose sole function is to undo tangles in DNA. Topoisomerases are essential to life, and some antibiotics work by attacking these enzymes in bacteria so that the DNA becomes hopelessly tangled. Vazquez explained her work in two videos for Youtube channel, Numberphile. The first is at the top of this story. Here's the second. The field of statistics is crucial to working with “big data,” whether in business, science or government policy. Advances in technology mean we have more data available to mine for information than ever before — if we can figure out how to handle and use it. Last year, a team of UC Davis statistics graduate students put their data handling skills to the test against the world’s best, winning first place in the 2016 Data Mining Cup, in Berlin, Germany. The international data analysis competition focused on online fashion retail, including the influence of rebates and coupons. Using anonymized historical order data from a real online shop, the teams had six weeks to develop models that predicted new orders and returns. The UC Davis team beat out the field of 120 entries from 30 countries, earning a prize of 2,000 Euros (about $2,220). Team members Minjie Fan, Qi Gao, Hao Ji, Nana Wang, Jilei Yang and Chunzhe Zhang came out of the course “Statistical Practice and Data Analysis” (Statistics 260), and traveled to Berlin as one of the top 10 teams invited to present their models during sponsor Prudsys AG’s annual summit on data personalization. Getting a sofa, or any large, bulky object around a corner can be a challenge when you’re moving house. It’s also a puzzle for mathematicians. The “Moving Sofa Problem” asks, what shape is the largest object that can move around a right-angle hallway? UC Davis mathematician Dan Romik began working on the moving sofa problem as an offshoot of his interest in 3-D printing: He printed out different shapes and experimented with them. But the hard part is not just showing a particular shape can fit round a corner, but proving that it is the largest shape that can fit. In a recent paper, Romik put his own twist on the problem by showing that a dumbbell shape “sofa” is the largest (so far) that will fit round two consecutive corners. Read more about the moving sofa problem. Engineers have invented a range of technologies for detecting chemical weapons, explosives or other threats. But the technology are mathematical algorithms that can handle large amounts of data and zoom in on threats while ignoring environmental “noise” and false positives. UC Davis mathematician Thomas Strohmer works on developing these algorithms. For example, hyperspectral imaging captures light at many different wavelengths rather than the three colors of a conventional camera. Under ideal conditions, this generates a distinct signature for different chemical compounds. A hyperspectral instrument mounted on an airplane, though, is operating under less than ideal conditions. It would be collecting a lot of data with a lot of “noise,” and if the goal is to quickly pinpoint a chemical threat, the data would need to be processed very quickly. Strohmer also works on the math of “deconvolution,” which automatically “un-blurs” a blurry object. “Blind deconvolution” can resolve a blurry image without knowing what it should look like. Strohmer is also collaborating with engineering faculty at the Department of Electrical and Computer Engineering at The Ohio State University who have developed an imaging device working with wavelengths between microwaves and X-rays that can “see” through clothing and just under the skin. The UC Davis Center for Quantum Mathematics and Physics (QMAP) was established in 2015 with the modest goal of understanding how our universe works. The center’s members carry out fundamental research in areas such as String Theory, gravity, cosmology and high-energy physics, where math and physics overlap. Five new faculty were hired to establish the center: Tudor Dimofte in mathematics, and Veronika Hubeny, Mukund Rangamani and Jaroslav Trnka in the physics department. There are also a number of faculty, postdoctoral scholars and graduate students in the math and physics departments who are associate members of the center. The center’s director is Andreas Albrecht, distinguished professor of physics.